There are mysterious goings on in the dead of night, and I'm not just talking about that family of raccoons who have been treating your trash cans like a casino buffet. I'm talking about more mystical happenings involving otherworldly creatures who are not in fact interested in pillaging your mom’s green bean casserole. These are the Nightriders, a group of bird spirits that can travel between worlds as they carry with them information of things unseen. See, even when you think no one is all up in your business your secrets are still not safe. If they weren't so dang cute I would be at the store right now buying aluminum foil to cover all my windows and make hats out of to confuse their secret-gathering methods. Will they reveal all of their otherworldly knowledge to you? There’s only one way to find out when these critters from Nathan Jurevicius are released. Featuring a mixture of Dunny and Munnyworld figures, this blind boxed mini series is beautiful in its simplicity. And each figure comes with a bonus, stackable owl companion! Now you can finally realize your dream of having a stackable owl companion named Felix who solves riddles and collects magic-infused gemstones.. That's kind of a weird dream to have when you think about it. 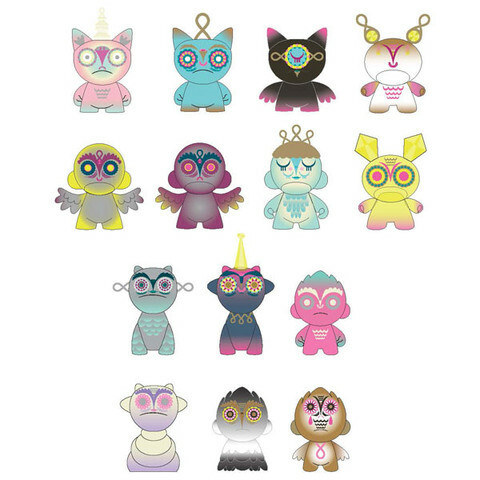 These will be available starting Friday, January 29th on www.kidrobot.com and wherever you prefer to buy your designer toys.